Feliz nossa é uma propriedade à beira do lago com a sua própria doca. Traga o seu barco ou jet ski ou alugar um lá. A casa não é extravagante ("rústico" é mais apropriado), mas o hotel é absolutamente belo em uma parte mais tranquila do lago com menos tráfego de barco do que a maioria das partes do lago. A casa pode acomodar confortavelmente 14, ea grande cozinha irá permitir que você cozinhar ou churrasco suas refeições. A casa é apenas uma curta viagem de carro ou de barco passeio de restaurantes, cinema e The Creamery (melhor sorvete da DCL). Passe o seu dia a tubulação, esqui, wakeboard ou simplesmente nadar no lago. Relaxe na rede ou tomar cocktails no banco dos réus enquanto vê o belo pôr do sol. Marshmallows assados ​​sobre uma fogueira e se surpreender com o número de estrelas no céu. Trilhas aventuras em parques estaduais Swallows cai e Herrington Manor estão a poucos minutos de distância. Máquina de lavar / secar roupa e leitor de DVD / vídeo. Você vai adorar Ours feliz! Banho de baixo tem chuveiro. O banheiro de cima tem banheira com chuveiro. Você deve trazer suas próprias toalhas. Recomendamos toalhas de banho e de praia. Security deposit refund!! As of September 12, I have not received my refund. Diane said as of 8-23 it was sent to my Mastercard but it is not on there, just checked and called. We did refund her security as promised on August 24 and it showed up her in her bank account August 25 as she paid the balance due by electronic check. Below is her email apologizing for the confusion. "Sorry, I expected a check in the mail. I just checked my bank statement and as of 8-25 there was a deposit of $230.00 As I make numerous small deposits as such I just thought I forgot to add something in. I do apologize for the inconvenience." I had let her know that our house cleaner had to clean up her trash which they had left at the property. The raccoons had gotten into it and scattered it all over. I paid our house cleaner an extra $20 for the extra work and took it out of the security deposit. We made the best of a bad situation. Aside from a decent upstairs bathroom, the rest of the house appeared to be severely neglected. We couldn't use second floor deck for some reason. Probably because the doors didn't work. The main floor carpeting looked like it was 100 years old. If the water hadn't stopped working we would have never seen what a nightmare the basement was. There was trash everywhere down there. Thankfully, my husband was able to quickly figured out that the water filter was clogged. We had to buy a replacement filter in order to get the water flowing again but he had to work against the cinder block walls that were leaking from the storm that came through the first day we were there. We spent most of our time on the lake. Luckily the weather was perfect after the first day. The internet was going in and out all the time. My husband had to spend a whole day at the McDonald's down the street because they had free wifi. We had to keep our food in the refrigerator or the mice would run off with it. The house was half the price that we usually paid so I guess you get what you pay for. Never again. The house is old, but well maintained. We advertise and price it accurately so renters know what they are renting. It's an old, but charming house on a wonderful, level, lake front lot with a dock on the sunny side of the lake. Most of our hours are spent outside enjoying the lake and lawn. Our housecleaner takes pride in making sure the house is cleaned thoroughly. We have never had any complaints. We will purchase a second set of blankets so if those need to be washed as well she can take them home to do so. When we were notified that the water wasn't working we immediately contacted our handyman. We expressly state that renters should not go down to the basement which is not livable space. When you told us there was a mouse problem (that you are the only renter who has ever mentioned and we haven't seen any evidence of mice on our visits to the house) we again immediately contacted our handyman. He made two separate trips to the house at our expense to deal with the issues. I make myself very available and responsive to renters. We are sorry that your trip wasn't what you expected as we hope everyone enjoys our house as much as our family does. We love the location of this property. We like to spend as much time as we can outside. The yard and the dock are great! Big kitchen with a table big enough for all. Also it's close to everything including Swallow Falls and shopping. 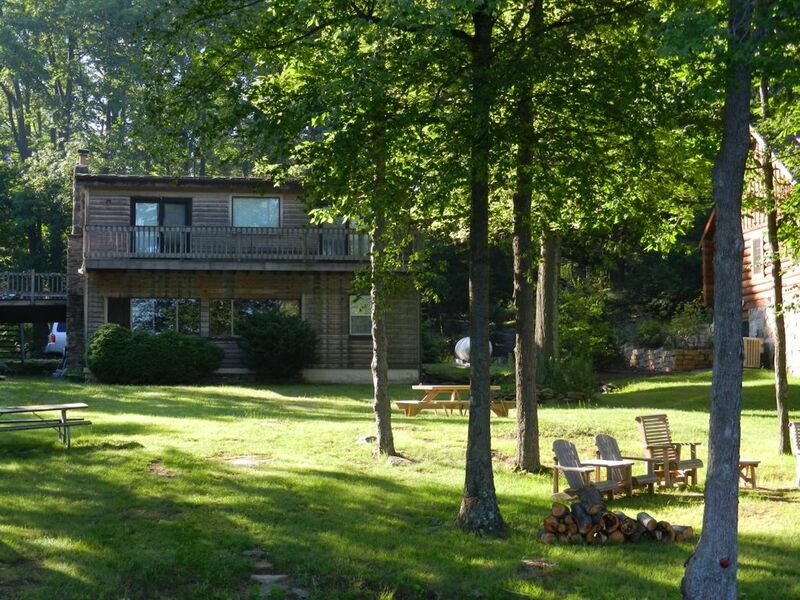 Great location on the lake! House accommodates a good # of people. Could use some updating in kitchen, bathrooms. Would have loved a deck to sit out and enjoy morning coffee or drinks at night. Great dock and cute fire pit area. It was Great, you have a beautiful home. The view out of your picture windows is outstanding.